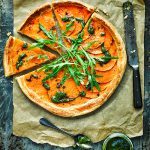 This gorgeous tart is sweet and savoury at the same time; the key to perfecting it is remembering that the thinner the slices of butternut the better. The homemade pesto takes this recipe to the next level! To help you whip up a real treat, celebrity chef Lucy Watson shares one of her favourite vegan recipes that is perfect for any Big Lunch. 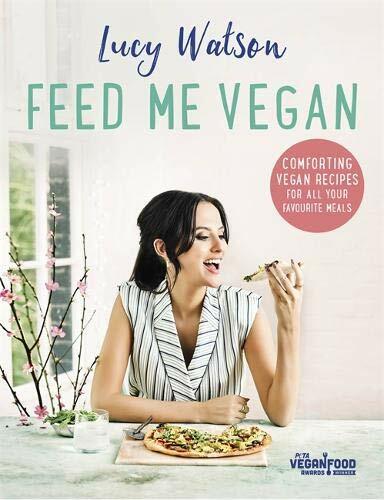 Author Recipe from ‘Feed Me Vegan’ by Lucy Watson, published by Sphere. Preheat the oven to 200°C (180°C fan, gas 6) and line a baking sheet with baking parchment. Put the butternut squash slices in a bowl and add the thyme, chilli flakes, maple syrup and oil. Season with salt and pepper, then toss together to coat. On a lightly floured work surface, roll out the pastry to 5mm thick. Using a dinner plate or something similar as a guide, cut a circle from the pastry about 27cm in diameter. Put the pastry circle on the prepared baking sheet and, using the tip of a sharp knife, score a circle about 1cm from the edge. Arrange the butternut slices on top of the pastry, overlapping the slices and making sure you stay clear of the scored edge. Put a sheet of baking parchment on top of the tart, and another baking sheet on top, then bake for 20 minutes. Remove the top baking sheet and baking parchment, and continue cooking for 25–30 minutes until the pastry is perfectly golden brown and puffed around the edges. While the tart is baking, make the pumpkin seed pesto. Toast the pumpkin seeds and pine nuts in a dry frying pan over a medium-high heat for 1–2 minutes until the pumpkin seeds start to pop and both seeds are fragrant and lightly browned. Put the seeds and the remaining pesto ingredients into a mini blender and pulse until combined. (Alternatively, you could use a mortar and pestle, adding the oil at the end.) Season with salt and pepper. 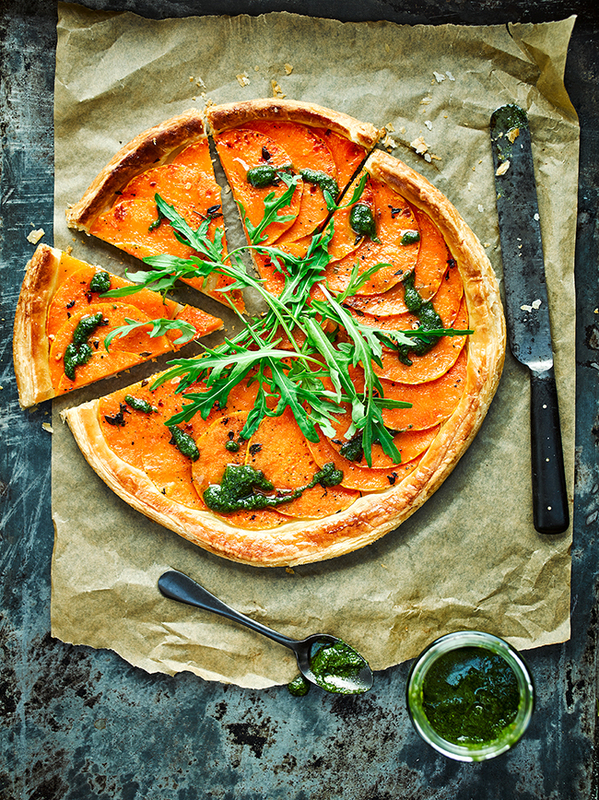 Drizzle the tart with the pesto and serve with some rocket leaves. Recipe from ‘Feed Me Vegan’ by Lucy Watson, published by Sphere. The Big Lunch is about millions of people getting together to share food and get to know each other better. Every year, over 6 million people take to their streets, gardens and neighbourhoods to join in for a few hours of community, friendship and fun. You’ll find everything you need at thebiglunch.com including registration for a FREE pack to help you organise your own Big Lunch. Everyone’s invited – so what are you waiting for? Come join the biggest community celebration the UK has ever seen on June 1-2!